In recent times Toyota has been showing signs of life. After a seven year drought of fun, cars like the LFA and FR-S are bringing back some of the playful and sporty attributes that used to make so many Toyotas desirable. 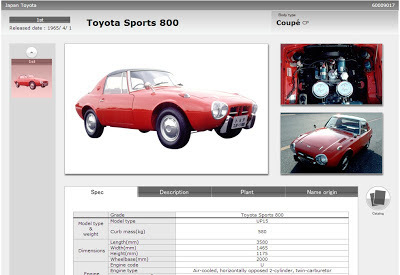 Toyota has clearly been taking notes from it's past and recently launched a massive interactive timeline so that anyone can check out the brand's storied past. The amount of information on the page is almost overwhelming. The timeline covers every single Toyota model and provides technical specifications and brief description of every model and every generation of that model. It's simply vast. Browsing through the site, innovative, fun and lightweight cars are everywhere. Toyota can certainly make a world class sporty car. So why aren't there any in Toyota (Not Scion!) dealerships? Nissan made a similar website but your Japanese better be sharp if you're going to read it. The pictures are still nice to look at.